The Cinnamons of the market are the inner barks obtained from trees of tropical countries and islands. The plants are quite ornamental; twenty to forty feet high; smooth, enduring, green, simple, and entire leaves. The flowers are small and very insignificant in appearance. 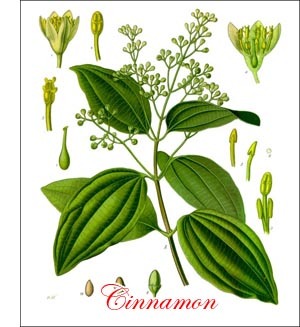 Cinnamon is an old-time, highly prized spice. There are several varieties of cinnamon upon the market. Cassia cinnamon, which is a Chinese variety, is obtained from Cinnamomum cassia. The bark is quite thick and contains only a small amount of volatile or ethereal oil. It is of little value, yet it is exported on a large scale. It forms the cheap cinnamon of the market. There are other Chinese cinnamons of good quality which constitute the principal commercial article. The Saigon cinnamon is by far the best article. It also is Chinese, obtained from an undetermined species. It is the strongest and spiciest of the cinnamons, and it is the only variety official in the United States Pharmacopoeia. The bark is of medium thickness, deep reddish-brown, and rich in volatile oil. The Ceylon cinnamon, from India, is noted for the delicacy of its flavor, but it contains comparatively little volatile oil. The bark is very thin and of a lighter brown color than that of the Saigon cinnamon. Nearly all of the cinnamon of the market is obtained from cultivated plants. There are large plantations in southeastern China, Cochin-China, India, Sunda Islands, Sumatra, Java, and other tropical countries and islands. In many instances little or nothing is known regarding the cultivation, collecting, and curing of cinnamons. As a rule, the trees are pruned for convenience in collecting the bark. In the better-grade cinnamons the bark from the younger twigs only (one and one-half to two years old) is collected.